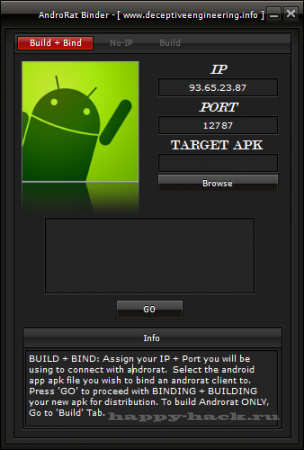 Androrat is a client/server application developed in Java Android for the client side and in Java/Swing for the Server.The name Androrat is a mix of Android and RAT (Remote Access Tool).The goal of the application is to give the control of the android system remotely and retrieve information from it. 1. You have to make a id on Here and create a host. 2. You need to open port you want to use. To do that Open Control panel > Network & Internet > Network & Sharing center Then click on see full map option Right-Click on the Gateway or router>Properties In general tab, Go to settings , Click on add In Description of service , Write Androrat Now you have to check your ip, To Do this , open command prompt, type ipconfig, Scroll To ethernet Adapter local area connection,and note down the ipv4 address Now come back to Add window , in the name or ip address type the ipv4 address you have noted Now in the external & internal port number , type 81 , tcp should be selected, click ok Now click on Add button again…Now in Description , write androrat 1 In the name or ip address, type the ipv4 address you have noted Now in the external & internal port number , type 81 , udp should be selected, click ok.
3. Now extract the file , Open AndroRat Binder.exe. 4. Go to No-ip tab and fill your information & click on update. 5. Go to Build Tab. 6. In IP section, type the hostname you have created by no-ip. 7. In port section , type 81. 8. In apk title ,Type any title you want. 9. Check the hidden box to hide the apk from mobile’s app drawer. 11. Now you will see the apk with the title you have given in the extracted folder. 12. Now install that apk to any android mobile phone. 13. You will find a folder named Androrat in the extracted files. 14. Open Androrat>Androrat.jar (you should have java installed in your pc to open it). 15. Now click on server> Select port and enter 81, click ok & restart it. 16. Now , as soon as the android client is online , you will find it on the jar file ……select any server online. What is Enumeration in hacking ? How TOR network works ? An attacker just creates a video by stuffing the malware within it and just sends it as a message to your number. As soon as your phone receives the message, it processes the message and triggers the vulnerability.